Will Dillashaw manage to cut 10 lbs by the time he steps on the scale at the weigh-ins? Moving down a weight class is no mean task and TJ Dillashaw is finding out the hard way. As revealed by senior MMA reporter Mike Bohn, the UFC Bantamweight Champion woke up today weighing in at 135 pounds, which is ten pounds off the Flyweight limit at 125 lbs. The upcoming Fight Night 143 event will be headlined by a champion vs. champion fight as TJ Dillashaw will take on Henry Cejudo for the UFC Flyweight title. This would be Dillashaw's first fight at 125 lbs as he looks to become the fourth simultaneous multi-divisional champion in the UFC. Conor McGregor, Daniel Cormier, and Amanda Nunes are the only fighters to have accomplished the astonishing feat. If Lieutenant Dan wishes to join the aforementioned list of names, the first thing he would need to do is to cut weight in order to be eligible to win the title in the first place. With two days left to go or the official weigh-ins, it's a race against time for Dillashaw to get his body in shape for the lower weight super fight. 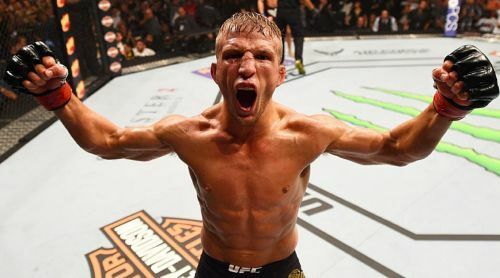 It may seem like an alarming situation for Dillashaw's camp but pundits and fans are confident about Dillashaw making weight in time for the official weigh-ins. There is no need to panic as this is presumably Dillashaw's first cut and the next few days will be dedicated to the routine water cut. Water cuts are an integral part of the weight-cutting process for fighters moving down to unfamiliar weight classes. It's undoubtedly going to be tough but losing ten pounds by cutting down on the water intake should ideally get the job done. However, it would predictably take a toll on Dillashaw's body who would have to deal with heavy bouts of dehydration in the coming days. UFC Fight Night 143 will take place on January 19th, 2019 at the Barclays Centre in Brooklyn, New York. Cejudo too has had issues making weight in the past but the concern is more prevalent in Dillashaw's' case as he is a natural Bantamweight. Let's hope both men come under 125 lbs at the time of the weigh-ins as a lot is on the line in a fight that could potentially mark the end of the Flyweight division in the UFC.